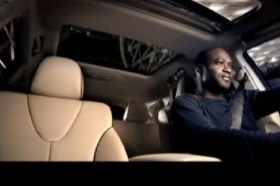 Toyota's 30-second spot promoting the 2009 Venza crossover will air during the first quarter. For the first time in eight years, the Detroit 3 will sit on the sidelines rather than advertise during the Super Bowl telecast. Three import brands -- Hyundai, Audi and Toyota -- are buying ad time during Sundays NFL championship game. So is Cars.com, an auto shopping Web site. NBC, which is broadcasting this years game, is charging $2.8 million to $3 million for 30 seconds of commercial time. The game is expected to attract 100 million U.S. TV viewers -- nearly one of every three Americans. Mike Bernacchi, a marketing professor at the University of Detroit Mercy, says the Super Bowl is as much a statement game for auto advertisers as for the Pittsburgh Steelers and Arizona Cardinals. Dont think for a minute that Hyundai, Audi and Toyota are not loving the fact that no American car companies are in Americas biggest game, Bernacchi said. The last time neither General Motors, Ford Motor Co. nor Chrysler advertised during the Super Bowl was in 2001, according to an Advertising Age listing. Before that, none of the Detroit 3 advertised in the 1991 Super Bowl. GM and Ford say they are cutting their marketing budgets for 2009. Gary Topolewski, a Detroit advertising executive who helped craft a Cadillac commercial that aired during the 2003 Super Bowl, said the Detroit 3 would likely avoid making an expensive media buy this year while GM and Chrysler LLC are using emergency federal loans to survive. GM decided last September not to advertise during Sundays game, spokeswoman Kelly Cusinato. We did not have a major vehicle launch aligned with the game, she said. GMC advertised during last years Super Bowl. Audi will promote its A6 sedan during the first quarter of Sundays game. The 60-second commercial features action movie star Jason Statham. The spot shows Statham being chased by luxury vehicles over several decades. He dodges pursuit in the A6. Also during the first quarter, a 30-second Toyota Division commercial will advertise the new 2009 Venza crossover. The ad is produced by Burrell Communications, which handles Toyotas advertising to blacks. In a 30-second commercial in the second quarter, Hyundai will celebrate its North American Car of the Year award for the 2009 Genesis sedan. A jury of 50 auto journalists bestowed the award. Another 30-second commercial in the third quarter will tout a new Hyundai program that allows buyers and lease customers to return a new vehicle if they lose their job within a year of purchase. Cars.coms 60-second commercial will run during the second quarter. It portrays a young man who lacks confidence in his car-buying skills, but gains it by using the Web site. Audi and Hyundai both advertised during last years Super Bowl. Audis commercial for the R8 sports car -- a spoof of the movie The Godfather -- tripled traffic to the automakers Web site within a month of the game, said spokesman Jeff Kuhlman. Hyundais two Super Bowl spots for the Genesis drew 300,000 visitors to the companys Web site during the game, said spokesman Chris Hosford. Those contacts generated 25,000 sales leads, he said.